The EYFS states ‘Parents are children’s first and most enduring educators. When parents and practitioners work together in early years settings, the results have a positive impact on children’s development and learning. This has also been demonstrated within the Effective Provision of Preschool Education (EPEE) research showing greater outcomes when parents and nurseries work effectively together. We encourage families to share ‘wow’ moments with us at nursery, celebrating children’s successes and using this information to further learning and development of each individual child. Parents evenings take place twice a year to discuss children’s progress and development. With this in mind we work hard to build positive working relationships with all our parents and carers here at Summerfield. We regularly invite our families to participate in nursery activities and events and value all feedback to continually improve our services. Home link activities are regularly shared to help further develop children’s learning, and we encourage our families to help children to achieve their next steps in learning by sharing targets and home activity tasks and ideas. Newsletters are emailed to parents bi monthly, keeping you up to date of all relevant information, event dates and a summary of what our learning focuses are for the months. Hard copies of our newsletters are also available in the nursery foyer, and online on our website. 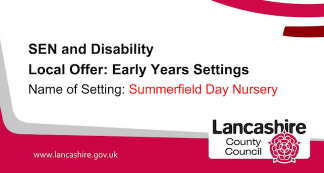 We have put together an information sheet with details about our Local Offer Setting at Summerfield Day Nursery, please download the PDF with full information by clicking here or on the image below. 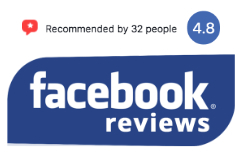 The local offer brings together information that is helpful to children and young people with special educational needs and disabilities and their families. 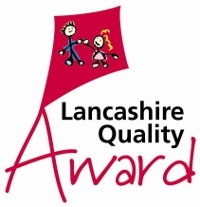 Please click here or on the image below to view the information available on Lancashire County Council Website.